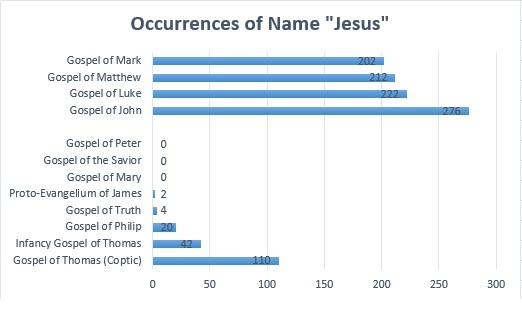 There's a wide variation in how often each document mentions "Jesus", or whether it ever mentions him by name at all. Some of the non-Biblical documents show interest in Jesus indirectly by way of focusing on his friends or family; some know him as a "Savior" with religious significance but do not focus on a first-century Jew from Nazareth; and some alternative gospels do not show much interest in Jesus either as a person or as a religious concept. Among the non-Biblical documents in these charts, the Coptic Gospel of Thomas distinguishes itself for having the clearest interest in Jesus outside of the Biblical gospels, estimating by how often his name is mentioned. 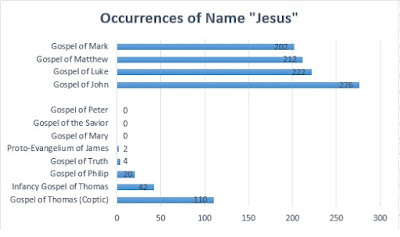 Though it is not the longest of the documents under consideration, it mentions the name "Jesus" more often than the combined total of the seven other non-Biblical documents that we're reviewing here. By content, it is also unique among the documents as being a collection of sayings attributed to Jesus. The high incidence of the name "Jesus" in such a short document traces to how it contains a series of sentences stating "Jesus said ...". Update: 02/04/2018: I found that some of the counts had been mis-transcribed by transposing the counts for two of the documents. I have updated the charts and post accordingly. That kind of thing is oddly fascinating to me. 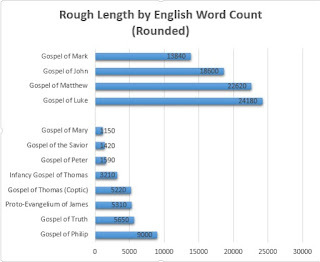 "Red Letter" Sections Outside the Bible?